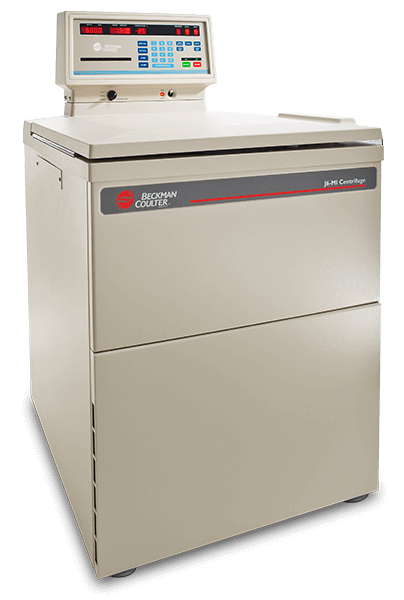 Simply the Best High-Capacity Centrifuge You Can Get To all the advanced features standard to J6 Series instruments, Beckman Coulter has added even more to the J6-MI. The brushless induction drive, based on Beckman Coulter's legendary ultracentrifuge technology, virtually eliminates maintenance for the ultimate in throughput and productivity. Plus microprocessor control with 9 different acceleration and deceleration profiles gives you the utmost control over run conditions. With the J6-MI, carbon brushes, which are the primary source of drive wear, have been eliminated. Like Beckman Coulter ultracentrifuge drives, this innovative drive uses a rotating magnetic field to induce torque-producing current. With no brushes to wear out, you get high performance that is virtually maintenance-free. With the top-of-the-line J6-MI, you enjoy: Worry-free performance for years of outstanding throughput With its advanced induction drive, you'll never have to change brushes, because there are none. This innovative drive provides outstanding performance and long drive life. It's so reliable we warrant it for a full three years.